This site is dedicated to audiophiles and recording engineers that are interested in the jitter phenomenon. Altmann Micro Machines is a german company focusing on the deliberate application of technology with the intent to improve customer's wellbeing through procreation of uplifting and joyful experience. 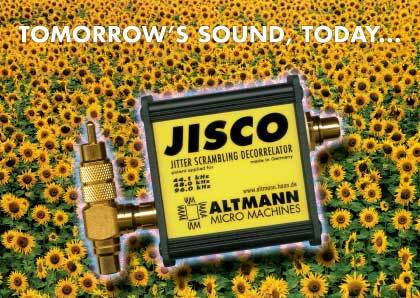 Specialty audio products and developments with a number of applied patents include the Altmann Superlative 24 bit / 96 kHz Digital to Analog Converter, The AMM - UPCI - Ultra Precision Clock Injector -, the AMM JISCO - Jitter Scrambling Decorrelator -, the Altmann SPLIF - Split Feedback - Amplifier Topology-, The Altmann Tube-o-Lator lacquer - a coating that makes semiconductors sound tube-like, the Altmann Do-it-Yourself Tonearm, The Altmann BYOB -Bring Your Own Battery- high performance vibrationally optimized audio amplifier and the Altmann Attraction DAC, a new and unique DA converter that can play up to 192kHz audio without oversampling and features extensive jitter filtering with dual VCXO precision PLL, switchable JISCO function, tube-o-lator-treated R2R converter, high-precision I/V conversion, and high power output and a vibrationally optimized desging employing a musical spruce sound-board. The Altmann Attraction DAC is the first DAC worldwide that can play fast sampled audio with zero-oversampling, sample by sample with unrivalled acoustic performance. Altmann Micro Machines was founded in 1994 by Dipl.-Ing. Charles Altmann.